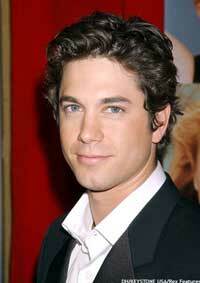 Adam Garcia is an Australian actor and dancer. He left university to play Slide in Hot Shoe Shuffle, which toured Australia for two years before transferring to London. When the show ended Adam stayed on in London to play Doody in the West End production of Grease, going on to play the lead role of Tony Manero in Saturday Night Fever which ran from 1998-1999. He reached #15 in the UK singles chart in 1998 with his cover version of the Bee Gees "Night Fever" from Saturday Night Fever. He worked with Idina Menzel and Kristin Chenoweth to help create the role of Fiyero in the 2002 workshop edition of Wicked and went on to play the role in London for a year from 2006-2007 starring alongside Kerry Ellis. He has extensive film credits including Wilde, Coyote Ugly, Confessions of a Teenage Drama Queen, Bootmen (based on the Tap Dogs story), Riding in Cars With Boys and Standing Still. Television work includes Doctor Who, Britannia High, Mr Eleven, Hawthorne and most recently as a judge on the Sky reality show Got To Dance and as himself in Heston’s Titanic Feast. Adam recently appeared in the musical/dance show Tap Dogs at the Novello Theatre for which he was the original co-founder of the troupe. He has just been playing the role of Bill Calhoun in Trevor Nunn's Chichester Festival Production of Kiss Me Kate which transferred into the Old Vic Theatre.